While Democratic leadership holds the line, apparently refusing to come to the table to negotiate, the resolve of House Speaker Nancy Pelosi and Senate Minority Leader Chuck Schumer in holding out might not be trickling down into the freshman class. Democratic New York Rep. Max Rose says he’s ready to get to work, and his first order of business is to reopen the government. Toward that end, he has called for serious negotiations from both sides — making it clear in an interview just days after he was sworn in that he was willing to go toe-to-toe with the leadership in his own party if necessary. Now it’s time for everyone in Washington to do the same, come to the table seriously, and let’s reopen the government. Democratic Rep. Jared Golden of Maine, a 36-year-old Marine Corps veteran, told the Sun Journal in his home state that he, too, was “very frustrated with all the leadership right now.” Golden also suggested a “common-sense, Mainer solution” that would involve including Republican leadership — House Minority Leader Kevin McCarthy and Senate Majority Leader Mitch McConnell — in any future negotiations. Virginia Rep. Abigail Spanberger, a Democrat who represents a district won by President Donald Trump in 2016, told Politico that her constituents had reached out to her office and raised concerns about the Democrats’ failure to negotiate. “If I am getting comments and contact from my constituents expressing concern that the Democrats are not prioritizing security, then I think we can do better,” she said. Democratic New York Rep. Anthony Brindisi cited food safety as the driving concern behind his push to reopen the government. 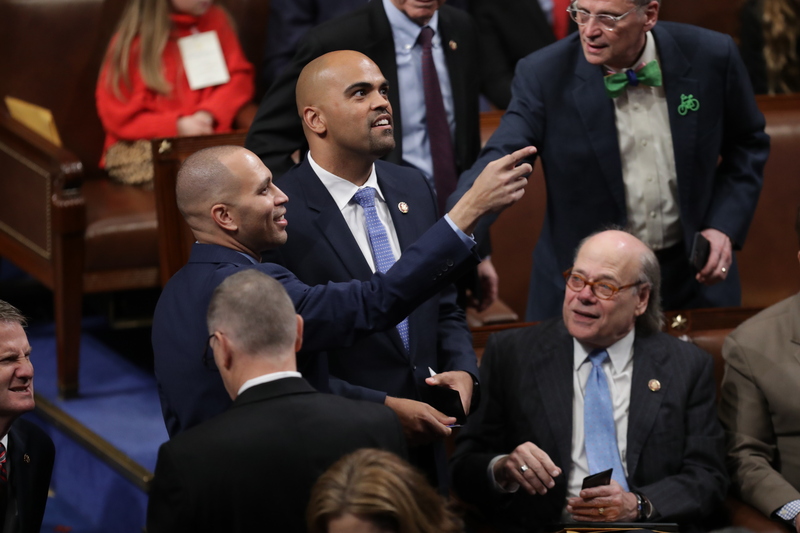 Texas Rep. Colin Allred said that he didn’t believe fellow House Democrats were the cause of the shutdown but conceded that their unwillingness to come to the table could hurt them moving forward. Georgia Rep. Lucy McBath, also a Democrat, urged a deal as well, telling Politico, “I hope that we can all come to a compromise because that’s the way things get done. If we don’t compromise, the American people are the ones who get hurt. Right now, they are hanging in the balance.” McBath stopped short of saying whether or not she would consider compromise on funding for the proposed border wall. New Jersey Rep. Jeff Van Drew, on the day he was sworn in, told VICE News that he was ready to negotiate. “If I had the opportunity to vote for some sort of a deal, I would,” he said. And it’s not just the freshman who are starting to talk deals. In spite of the number of Democrats who appear ready to at least come to the table to negotiate, when Trump seemed to open the door for them to do just that, the opposing party — at least its leadership — didn’t capitalize. A Tuesday border security meeting that was open to rank and file members of Congress was boycotted by Democrats. “Today, the President offered both Democrats and Republicans the chance to meet for lunch at the White House. Unfortunately, no Democrats will attend,” the White House announced.